Women player wanted for St. Mary’s Galwey Auctioneering National league ladies team. The ladies play in the National division one league. I will be honored to play ball for you all. I love the game of basketball and I am very good at it. I a senior in high school now and I average 24 points,10 assists,14 rebounds,3 steals,4 blocks per game my junior and sophmore year. My name is ALicia Heathcote and I am from the U.S.A. Last season I played basketball in Germany and I am now looking for a new team. My agent is Slammers, http://www.slammers.de where you can find my bio and stats. I am 24 years old, i am 5’10, 150lbs and I play the 2 or 3 guard. Please email me back if you are interested and my agent or I can send you some film. Hello, my name is Valencia and I am very interested in playing basketball overseas. I am 30 years old. I returned to finish out my eligibility at a DII university and recieved all conference honors. I am a leader with goals that I intend on fulfilling in time and this would be one of them. I can supply film and pertinent information if needed. Thank you for your time. My name is Coletta Seals. I am a senior at North Carolina A&T State University, and I am also a student athlete. I played one year for A&T, also I played three years of City League basketball, and four years of Intramural basketball which we are undefeated and won three championships, and one more to go. I am very interested in playing. 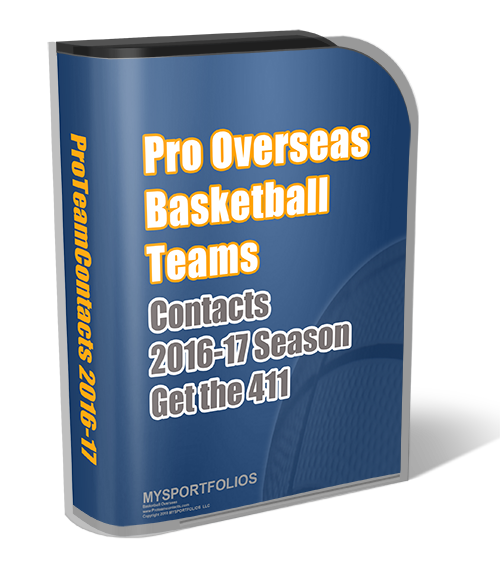 Can u send me some information regarding overseas basketball. Thanku for your time. I can play what ever position you need me to play. I have no agent. I am looking for somewhere to play. I am very interested in playing overseas. Please send me more information. Thank you. My My name is Keri Flynn and I just graduated from Bentley College and was on a full althletic scholarship. I am looking to play overseas and claim citizenship there. My grandmother is from Ireland and lived there until she was 21. I started 3 season and was the leading scorer 2 years for the Falcons and my junior year we went to the final four and I was player of the year in my conference, MVP if the NCAA regional tournament, and was named to the all tournament team in the Final Four. I averaged 18pts a game as a guard. IF you want more information about me please contact me. I want to play overseas more than anything in the world. I would love to play in Ireland so it is easier for me to claim citizenship. Please contact me back asap at pwskf22@aol.com and please give me more information. I can play the best game everywhere in Europe for nations. Can jump so high and win the game to the evening. Please to e-mail with me. Hi I am 30 years old, I am 5’8″ and weigh 125lbs. I am a 2/3 shooting gaurd. I have three children and I am looking to make a career playing professional basketball overseas. I played for the Atlanta Visions Semi Pro Team. I also played 4yrs of highschool and 1yr. 1/2 in college……Right now I play in womens leagues to stay inshape…..So far my team is undefeated…..I have a lot offer and I have no agent.